An Interdisciplinary Life: Why Go to NFL Training Camp? Why Go to NFL Training Camp? It has almost never occurred to me to attend an NFL training camp practice. I've been a 49er fan for as long as I can remember. I really like football. I've been the commissioner of the same fantasy football league for 14 years. I like going to games. I spend most Sundays watching football. Still, the idea of going out to a practice facility that isn't really designed to accommodate crowds to sit in the heat and pay $7 for water has never appealed to me. I mean, what's the point of watching practice? Sounds boring and inconvenient right? "I just won tickets to 49ers practice on Saturday, want to go?" I think I took all of thirty seconds to think about it. "Yes!" I replied. I did still wonder if it was going to be fun. I didn't even know where it was. 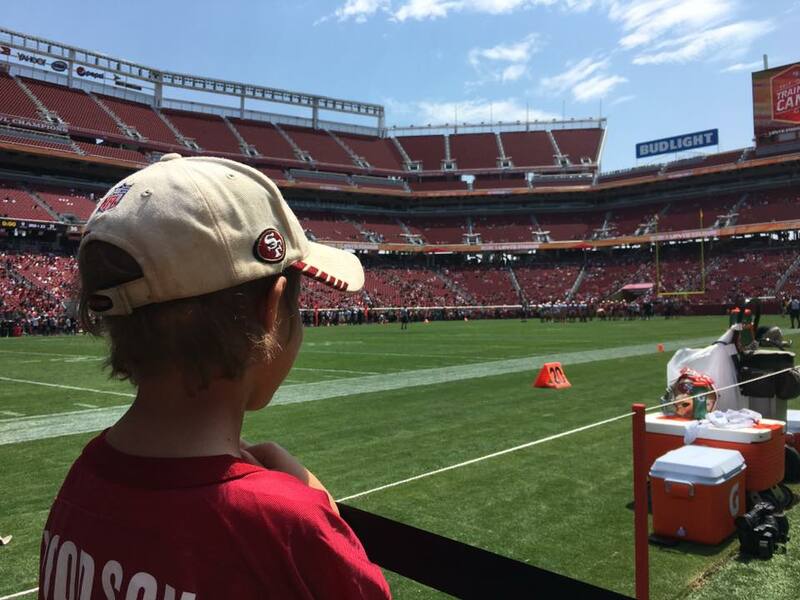 After finding out it wasn't in Napa (that's where the Raiders practice, duh) I was happy to hear it was at Levi's Stadium in Santa Clara and not at the practice facility. I was even happier to read that the food would be free. Daniel is awesome and suggested I bring Buddy with us. 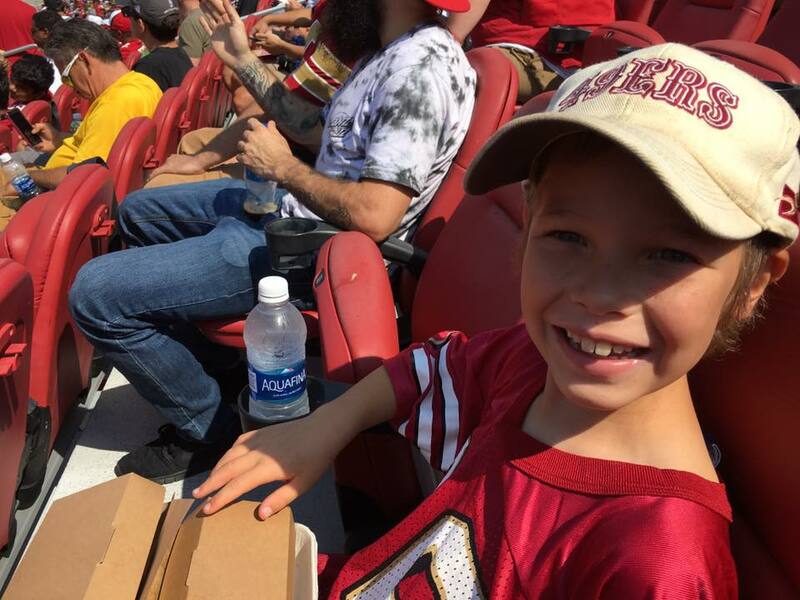 I was excited to see a new stadium, and Buddy had been wanting to go to an NFL game. 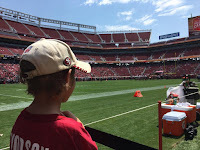 I can't afford that right now, so this was good chance to get him an NFL experience on the cheap, and for a duration (it was a 4 hour event) that he can handle. The only problem we encountered is that the parking and traffic flow around the stadium were terrible. They had traffic cops out to help, but it seem like a planning issue that just wasn't addressed well. Other than that, it was actually pretty cool. 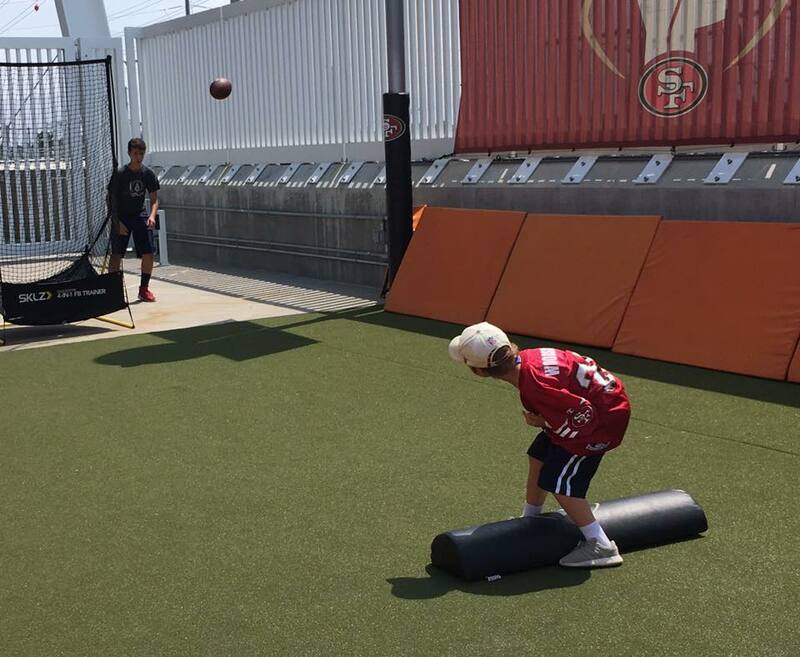 Why should you consider attending an NFL training camp practice? Read on for my unsorted, semi-chronological list. YMMV but it's unlikely 50,000 people are going to show up for practice. The concourse isn't crowded, there are plenty of bathrooms, there's shade. Also, the Kid Zone games don't have long lines. 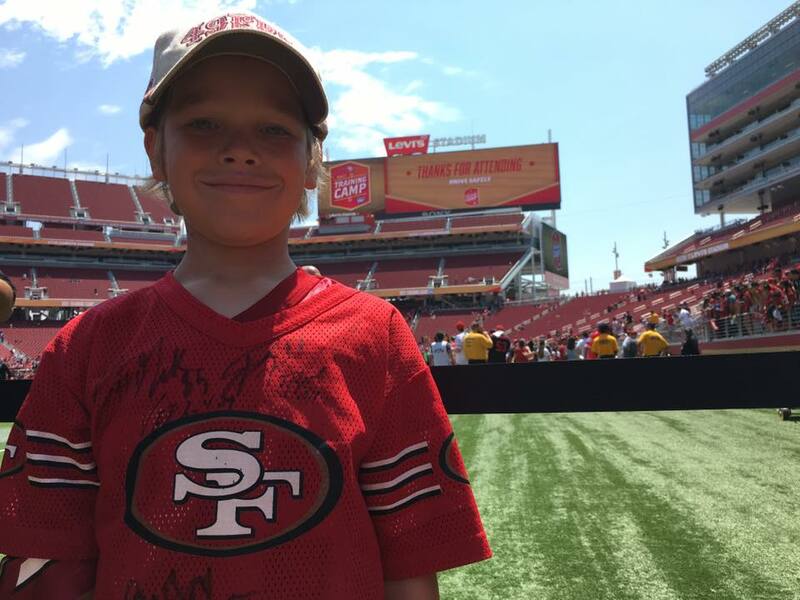 Maybe only terrible teams like the 49ers are doing this, but it was very cool. And it wasn't just the cheapo/terrible stuff. 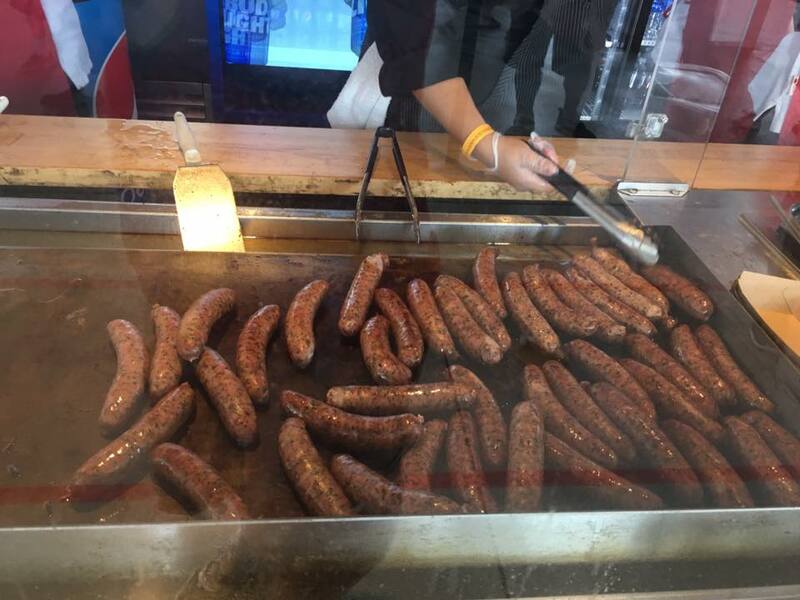 The sausages were legit. They also had nachos, pizza, soft drinks, bottled water and a bunch more available. The line moved quickly. 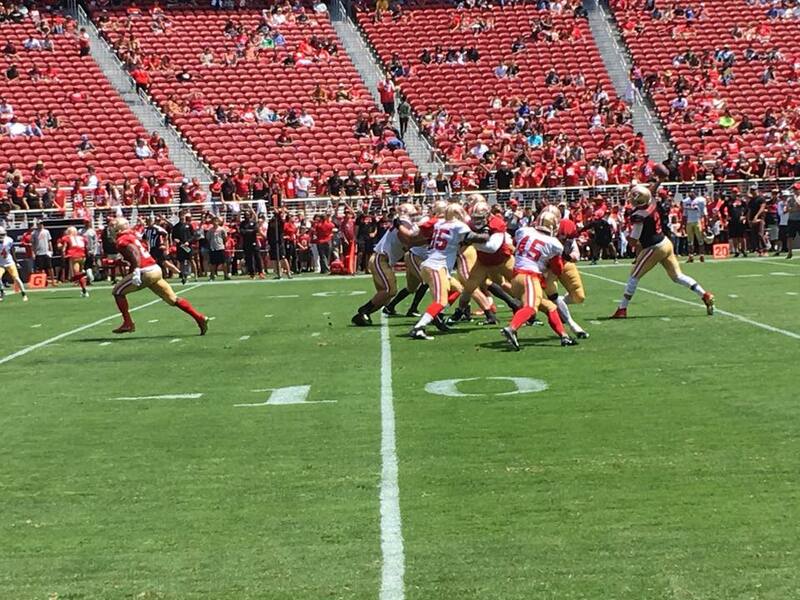 You could buy beer/wine (of course wine, it's the 49ers) for $14 if you wanted. 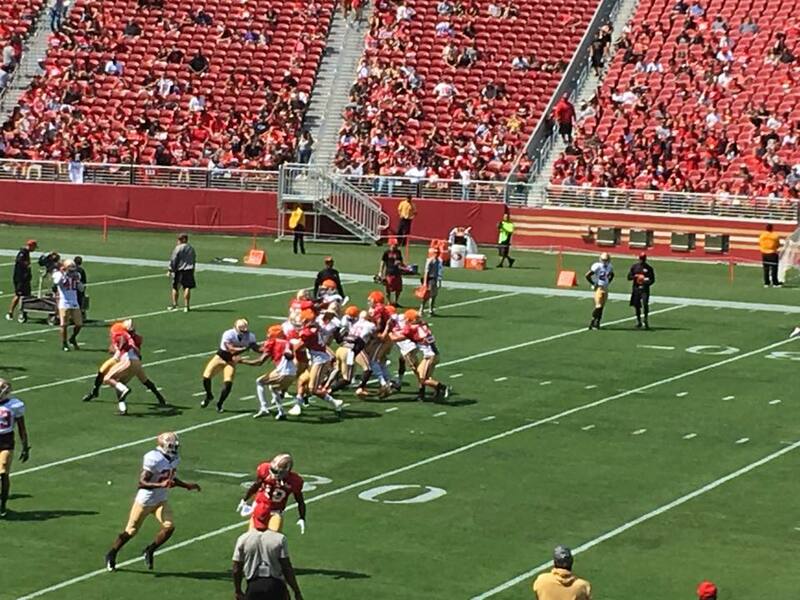 Again, a more popular or recently successful team may have their event fill up, not so in Santa Clara. We watched part of practice from seats we could certainly never afford. Buddy liked watching the 11-on-11 drills from up close. It was almost like watching a game. If you're in my tax bracket this is as close as you're likely to get. You get a good sense of the speed and power of the players when you're this close. Also, dude, look how cushy these chairs are. I actually enjoyed watching the punt coverage and 1:1 passing drills more than I thought I would. I was reminded that I like watching practice because you can get a sense of how each part of a play is broken down into smaller group or individual responsibilities. It's also great because you can really see differences in technique by each player. They run through the same drill over and over, which allows you to suss out what players do well, and what they're working on. If you're football nerd there's a lot to see. A lot of fans were able to go down on the field to watch the end of practice. I'm not sure how other people got their passes, but we got ours because my friend complained about the parking situation on Twitter. Not sure why that worked, but his guess was, "It could be because I have a verified account." By hook or by crook, we ended up down on the field during the two-minute drill. That was very cool. The offense was driving towards us and viewing everything from that vantage point allowed us to get a sense for the size and speed of the players. At one point Jeremy Kerley ran an out-route, made a great catch, and his momentum took him right into our knot of spectators. 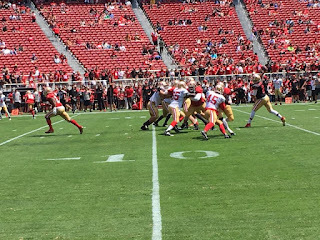 A few plays later Brian Hoyer threw a touchdown while standing just a few yards away from us. For this event kids under six got in free. The adult fans were happy to let Buddy stand in front of them, right at the rope that cordoned off our viewing area, so he could see. The security guards held their gruff security guard demeanor with the adults, but one of them was genuinely playful and kind to Buddy. He even made it on the Jumbotron again, making it his fourth time in four different stadiums. But the highlight was the players, who were polite at worst, and jubilantly interactive at their best. 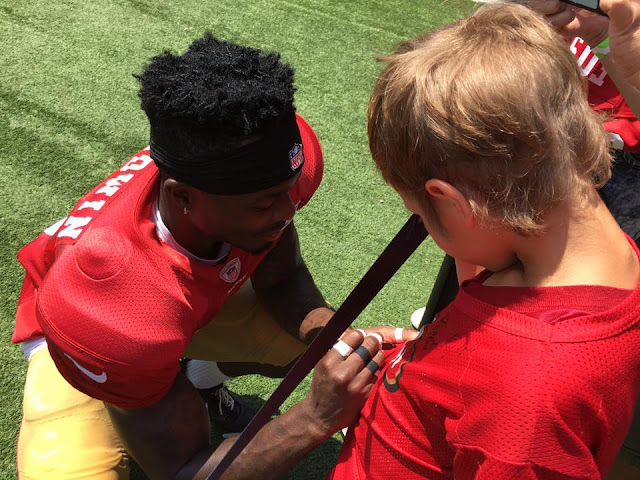 Wide receivers Marquise Goodwin and Jeremey Kerley were very accommodating to fan requests and stopped to chat with Buddy briefly while signing his jersey. Punter, Brad Pinion chuckled when I told him he was my favorite player. He doesn't know about my abiding love for kickers and special teamers. Most of the players were able to see through the throng of adults shoving hats and posters at them, picking out the kids and going to them first. 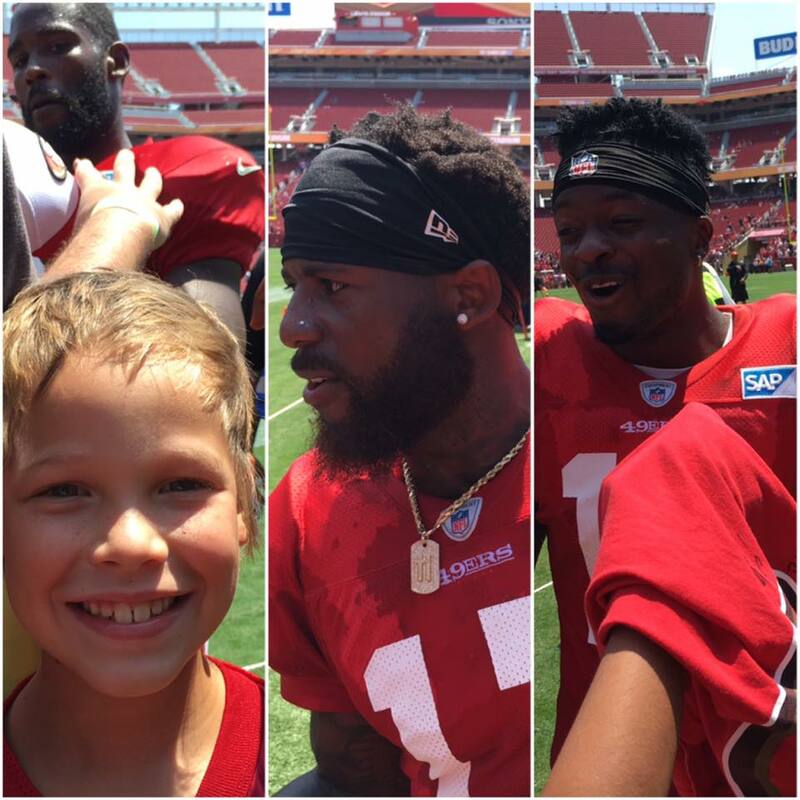 Buddy being able to meet players and get autographs was a special moment for me too. When I was five-years-old my mom took me to some 49ers banquet she had been invited to by a co-worker. I have no idea who I met that night, but I know they were players, and they were really nice to me. I specifically remember one spending a long time playing with my stuffed bunny with me. I left with a bunch of signed swag, all of which was lost to time over various moves and the fact that my mom didn't value it and I was little. Still, I was hooked on the Niners from then on. So if you've ever thought about going to an NFL training camp I suggest looking to see if your team is doing an event day. That's likely going to be the best organized day. If you don't live near your team, the practice environment can be fun. I wasn't excited about the idea of attending training camp, but I gave it a shot, and it was fun for everyone. I definitely recommend a trip for football fans who may not have considered it. 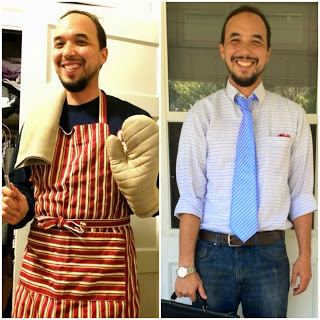 Win Free Registration to Latino Dad Summit!